Macau (Macao SAR) – August 24, 2018 (travelindex.com) – In continued support of UNESCO’s designation of Macao as a “Creative City of Gastronomy” and in an effort to build stronger awareness around Macau’s rich culinary heritage, Wynn is pleased to introduce the second ‘Wynn Guest Chef Series’ this year. 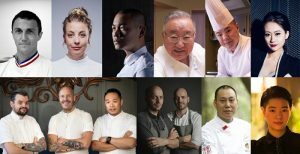 Starting August 31, the world’s most renowned chefs and mixologists are converging at Wynn Macau and Wynn Palace Cotai. Wynn has once again invited Michelin-starred chefs, and a number of award-winning renowned chefs will collaborate with Wynn’s leading chefs to present masterful culinary experiences. Wynn is also introducing an exciting new element to stir things up at this edition of Wynn Guest Chef Series, by inviting the region’s most talented mixologists to show off their award-winning cocktail concoctions. In 2010, Chef Pâtissier Luc Debove was awarded the World Champion of Ice Cream and in 2011, went on to receive France’s highest honor – the Meilleur Ouvrier de France (M.O.F.). In the culinary world, the M.O.F. title is a prestigious honor because contestants must show absolute perfection in their work, and since he has proven he can do so, he no longer needs to compete. At Sweets in Wynn Palace, Chef Luc will be serving a range of ice cream and sorbet which will melt in one’s mouth and taste just like eating fresh fruit. Chef Frida Ronge, founder and culinary leader of TAK restaurant in Stockholm, Sweden will present modern Scandinavian food culture with a touch of Japan at Mizumi at Wynn Macau. Chef Frida was awarded “Rising Star of the Year” by White Guide in 2013 for her dynamic and innovative approach to cooking. As with Japanese cuisine, she uses only the freshest ingredients of the season and a variety of creative techniques to create her dishes. in a remarkably creative way at Andrea’s. Hong Kong mixologist Jackie Lo is the first Chinese bartender to be invited to perform at Moskovsky, one of Moscow’s most famous bars, and she has won numerous awards from bartending competitions both at home and abroad. In September, Jackie will be on stage at il Teatro, where she will impress as she pours, shakes and stirs her cocktail creations. Chef Tsutomu Shimamiya, Master of Sushi for Mizumi of Wynn Macau and Wynn Palace will join Executive Chef Min Kim at Mizumi in Wynn Palace to present the most authentic of Japanese cuisine. Chef Shimamiya founded “Sushi Zen”, a Michelin two-starred restaurant in Hokkaido back in 1971. He devoted his life to studying traditional sushi techniques and was awarded the national “Master Contemporary Craftsman” award for professional achievement. This award is usually only granted to scientists, and Chef Shimamiya is one of just two sushi chefs to have ever received this honor. together, and aims to take guests on a journey through Ireland’s landscape and produce. Twin German brothers, Chef Mathias Sühring and Chef Thomas Sühring are the founders of Sühring in Bangkok, a one-starred Michelin restaurant and recently listed No 4 in the 2018 Asia’s 50 Best Restaurants Awards. Sühring showcases the best of modern German fare inspired by childhood memories, family recipes and years of travelling experience combining the essence of traditional dishes with contemporary Central European influences. The energetic chef duo will share the very best of Germany at SW Steakhouse. Chef Junichi Yoshida, Master of Teppanyaki for Mizumi at Wynn Macau and Wynn Palace will present authentic Japanese teppanyaki at the Michelin two-starred Mizumi at Wynn. The Ishigaki Yoshida restaurant opened by Master Yoshida has received one Michelin star from the Michelin Guide Tokyo. He insists on using only the finest ingredients, and the name of his restaurant, “Ishigaki”, refers to Ishigaki island, famed for its superb kuroge wagyu beef. For three consecutive years, Janes & Hooch has been recognized by the Asia’s 50 Best Bars awards, and remains the only bar in Beijing to have received such an honor. On behalf of Janes & Hooch, award-winning mixologist Jamie He will introduce her new cocktail creations featuring the flavors of Macau and Beijing. Renowned Chef Lan Ming Lu from Lanting Thirteen Chefs restaurant in China’s Sichuan province, will partner with Master Liu Guo Zhu of the Michelin two-starred Golden Flower restaurant at Wynn Macau to present authentic Sichuan cuisine. Lanting Thirteen Chefs restaurant has been one of the 50 most influential restaurants in China for five consecutive years. Chef Lan hopes to change people’s perceptions about Sichuan food and “return to the authentic flavors of Sichuan cuisine” because it is not always spicy. In doing so, he combines the flavors of Sichuan with ingredients from all around the world to create uniquely Sichuanese cuisine. powerful LED lights and fire effects. Wynn Macau is operated by international resort developer Wynn Resorts, recipient of more Forbes Travel Guide Five Star Awards than any other independent hotel company in the world. Wynn Macau continues to hold the distinct honor of being the only resort in the world with 8 Forbes Five-Star Awards for two consecutive years. Wynn Macau opened on September 6, 2006 and its second tower – Encore opened on April 21, 2010. Wynn Palace is the second luxury integrated resort from international resort developer Wynn Resorts in the Macau Special Administrative Region of the People’s Republic of China, following the launch of Wynn Macau. Located in the Cotai area, it features a 28- storey hotel with 1,706 exquisitely furnished rooms, suites and villas, versatile meeting facilities, over 106,000 square feet of renowned luxury retail, 11 casual and fine dining restaurants, Macau’s largest spa, a salon, a pool and approximately 420,000 square feet of casino space. The resort also features a variety of entertainment experiences, including the dazzling 8-acre Performance Lake that mesmerizes guests with a choreographed display of water, music and light, the unique SkyCab, spectacular, large-scale floraldisplays by renowned designer Preston Bailey and an extensive collection of art works by some of the world’s leading artists. Wynn Resorts is the recipient of more Forbes Travel Guide Five Star Awards than any other independent hotel company in the world. Wynn Palace is the first and only resort in the world with more than one thousand rooms to receive Forbes Travel Guide Five Star Awards. Wynn Palace opened on August 22, 2016. Book your hotel in Macao and around the world in 55 countries at best rates available. Pay at the hotel. Book now at HotelWorlds.com and Earn HolidayClicks Points for every dollar spend!